MONDAY, Oct. 6 (Health.com) — About 44% of children diagnosed with bipolar disorder continue to have symptoms of the psychiatric disease in adulthood, according to the first study to follow such children over time. The study supports the idea that children can indeed get bipolar disorder, once a controversial diagnosis thought to occur only in adults. Although the details are still murky, most psychiatrists now agree that children can have the disease. In adults, bipolar disease is characterized by dramatic mood swings, from depression to mania. In children, experts don’t always agree which symptoms warrant a bipolar diagnosis, what will happen to youngsters as they age, or which treatments are most effective. The new study answers a key question. “Do these kids with bipolar—when they grow up—get the adult form of the disease? And this paper says, 'Yes they do,'” says study author Barbara Geller, MD, a professor of psychiatry at Washington University in St. Louis. In the study, published in Archives of General Psychiatry, Dr. Geller and colleagues followed 115 children, with an average age of 11, who were diagnosed with bipolar disorder between 1995 and 1998. What’s more, about 35% were substance abusers, which is similar to the percentage seen in people who are diagnosed with the disease in adulthood. Next: Is bipolar disorder the correct diagnosis for these children? Is bipolar disorder the correct diagnosis for these children? It’s not certain if some children with other psychiatric illnesses are being incorrectly lumped into the bipolar category, says Ellen Leibenluft, MD, head of the pediatric bipolar research group at the National Institute of Mental Health and author of an editorial accompanying the study. Less than 1% of children have mood cycles that look like bipolar disorder in adults, according to Dr. Leibenluft, while 2% to 3% have the extreme irritability that may or may not be a sign of the disease. “It’s not clear whether they are bipolar or not,” she says. 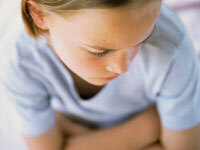 However, more research is being done to help determine what bipolar disorder looks like in children. Currently, a diagnosis is based on a child's symptoms, a family history of the disease, and other factors, she says. Researchers are now studying how genetics play a role and whether brain scans can help determine if a child has bipolar disorder. “I would say there’s a lot of work to be done in terms of treatment,” says Dr. Leibenluft. Children are typically treated with a trial-and-error approach using medication with serious side effects that haven't been adequately tested in children. Are Eating Disorders a Form of Addiction?